Pub just off Borough High Street, near London Bridge Station. This is the sort of pub that the phrase “tucked away in a cobbled courtyard” was invented for. 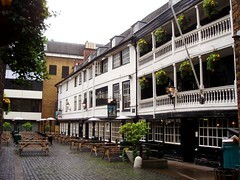 It's made up of the remains of a galleried coaching inn (the last one left in London, rebuilt in 1677 from an earlier inn, and now protected by the National Trust). Much historical significance, and quite cosy in the winter if you can actually manage to squeeze in, but possibly a bit too busy to be really comfortable. There are benches/tables and outdoor heaters in the courtyard to take the overspill (and the smokers). The courtyard actually doubles as a carpark at times, and part of it is used as seating for a wine bar opposite. Unusually, a gents' toilet is outside, though the ladies' (and a second gents') are quite well hidden inside at the back. Those who have not been to the George in some while and recoil at the thought of the outside gents' will be reassured to hear that they were refurbished recently (2012-ish) and are much more acceptable. When Peter was last here on a busy evening, they opened a secondary outside bar which is near the outside gents'. While it is much smaller and has less range than the main bar, it also offered a Real Ale that was not on offer inside. Note that the room on the right, closest to the main entrance from Borough High Street, has no access to the bar — you have to go outside and back in again, so bear this in mind if you're buying a round. There's a small serving area between it and the main bar which is occasionally open, much in the manner of a kiosk. There are rooms upstairs for hire but they were roped off on secretlondon's September 2008 visit, even though there was no seating left outside and the bar nearest the entrance was rented out to a private party. There were only two bar staff on and it took about 20 minutes to get served. As of September 2007, bar food is served noon-9pm Monday to Saturday, and noon-5pm Sunday, while the upstairs restaurant is open 5-10pm Monday to Saturday. A sign spotted in the same month also advertised Friday night barbecues between 7pm and 10:30pm, though I suspect this doesn't apply during the winter. Winter 2006/7 they were selling mulled wine for £3 a glass — not microwaved, but kept warm in a jug on a hotplate and really quite nice. Ales on tap are the standard Greene King range (IPA, Old Speckled Hen, Abbot Ale), as well as The George Inn Ale (also brewed by Greene King), which is a fair bit better than the others on offer and recommended if it's on. There are many many reviews of the George, basically boiling down to “nice and historic, but not really a great place to drink”. Peter disagrees slightly with this assessment: the beer is perfectly acceptable, and he typically chooses to drink here because it fills up less readily than other pubs in the area such as the Market Porter and the Rake, and thus is the best bet if it's a peak period and one wants a seat rather than standing outside. On bob's June 2015 visit the beers available were Greene King IPA, Bermondsey Bitter (£4.55/pint), and a couple of others. The beers were passable. The Long Horn Beef Burger (£17) photo was overcooked. Last visited by bob, June 2015. Opening hours taken from Time Out website, April 2008. Food times taken from signs outside the pub, September 2007. Last edited 2015-06-28 15:55:54 (version 31; diff). List all versions. Page last edited 2015-06-28 15:55:54 (version 31).